Just over three hours before boarding a plane to Argentina for the G20 leaders summit, Prime Minister Justin Trudeau said Canada's "still in discussions with the Americans" about signing the revised North American trade agreement. With roughly three hours to go before boarding a flight to Argentina for a meeting of G20 leaders, Prime Minister Justin Trudeau said this afternoon Canada is "still in discussions with the Americans" about signing the revised North American trade agreement at the summit. At a White House press briefing Tuesday, Donald Trump's economic adviser Larry Kudlow said that "representatives" from Canada and the U.S. would sign the United States–Mexico–Canada Agreement Friday, on the sidelines of the G20 leaders' summit in Buenos Aires. "We are still in discussions with the Americans about exactly that," the prime minister said on his way into question period this afternoon. His comments echo what government spokespeople told reporters Tuesday — that while they are still "tracking" toward a Friday signing, Canada hasn't confirmed the signing yet and the government is still working on a format for the event. It's not clear who would be signing on Canada's behalf. 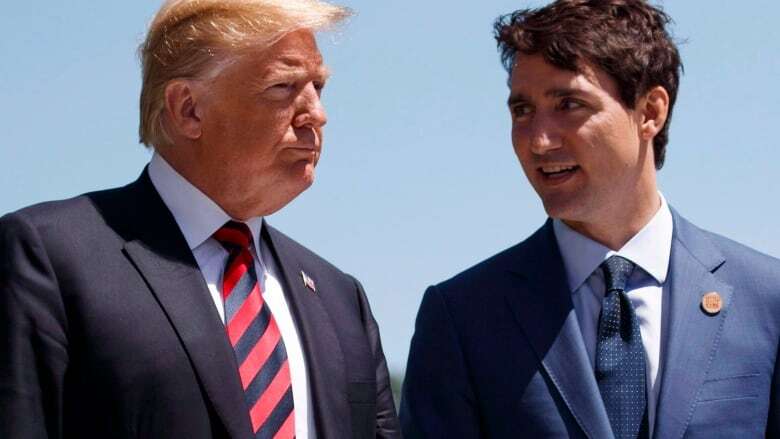 No bilateral talks have been announced between Trudeau and U.S. President Donald Trump at the G20, although Trump is meeting one-on-one with at least eight other world leaders in Buenos Aires. CBC News reported Tuesday that the two countries are still haggling over the text of the deal. The agreement posted online by the United States Trade Representative's office on Oct.1 included language Canadian negotiators apparently never approved. Officials say a "legal scrub" of the text continues. Canada has not posted its official version of the agreement in either official language, leaving it unclear whether the USTR's version will be the one the three countries actually sign in two days. So far, Canada has been unsuccessful in persuading the Americans to lift U.S. tariffs on Canadian steel and aluminum imports, despite the successful conclusion of negotiations to revise NAFTA earlier this fall. Both Mexico and Canada wanted those tariffs lifted before the signing ceremony took place.